This issue picks up right where the last issue does. With the All New All Different Excalibur (the name Kitty gave them), which consists of – Shadowcat, Meggan (in disguise), Captain America, Iron Man (but really, it is the War Machine armor, with Rhody in the suit) and Black Panther. They are trying to defend Wakanda from Icon, who is a wooden tree, given life! With his touch, he has turn several Wakandians into tree people. This is such a great line up, I wish they could have their own series! War Machine doesn’t recognize the name, Excalibur, neither does Black Panther. Captain America recognizes Meggan, even in her new form, so he knows who she is. He recognizes Kitty Pryde, of the X-Men but also from her current team, Excalibur. That Captain America, he stays current! Since his people’s lives are at stake, Black Panther surrenders his throne. Since he has done this, willingly, the new team are powerless to do anything about it. If they did, it would start a war! Meggan worries about Brian Braddock, who is Captain Britain but Black Panther didn’t know that, so when Icon appeared, he placed Brian into a safety hut. For some reason, Braddock keeps his identity secret. Even though he doesn’t do anything, except be Captain Britain. Also inside the hut, is Lockheed! Braddock notices the soft mud, beneath his shoes and starts forming a plan. Meanwhile, in London, Nightcrawler and Cerise is following the trail of The Knight Errant, who is stopping crime but in a harsh manner. He’s an old gentleman, so I say, let him go out in style! Braddock punches through the mud, can can rejoin the fight! He doesn’t care that Lockheed may have swallowed some mud! Icon’s first decision, as King of Wakanda, is to kill Excalibur’s weakness member, well the member he deems the weakest, but he chose the wrong one! Kitty presses the trigger on the gun, and it blasts her and War Machine! War Machine learns that she can turn ephemeral. She brags that is only one of her gifts, she is also great at trigonometry. In the blast, War Machine’s armor got a super upgrade. Groot, I mean, Icon, grabs Meggan. 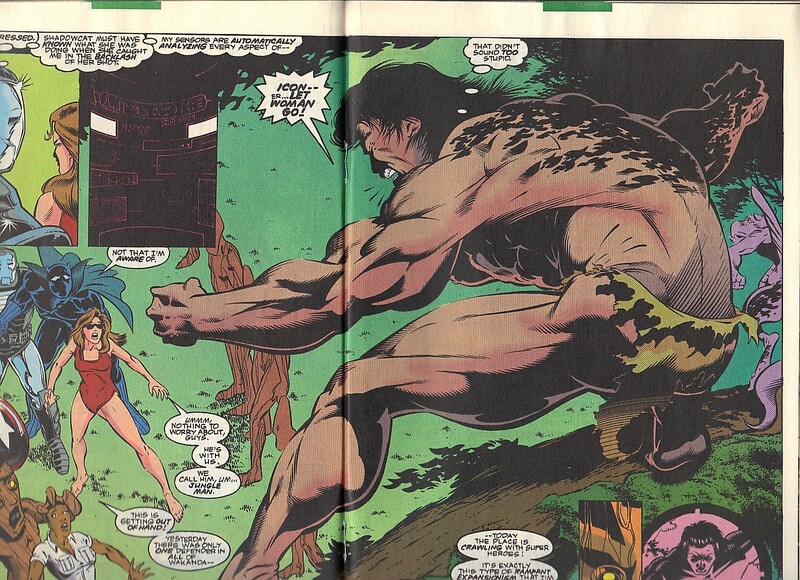 This upsets Jungle Man (Captain Britain, a la Tarzan, but with brown hair – from the mud), who Kitty names. Lockheed is right behind him! War Machine, Black Panther and even Icon, can’t believe yet another hero has arrived! Yesterday, Wakanda had one defender and now she has seven! Jungle Man tries to go with the name but tries to give the character a bit of a vocabulary. Captain America has heard less horrible names. To which, Jungle Man calls Cap – Star Forehead Man, which is right up there with Hulk’s Wing Head. Jungle Man is inspired (which ruins the previous joke) to call himself, Captain Wakanda! Which may be the fastest hero name change, in a while! 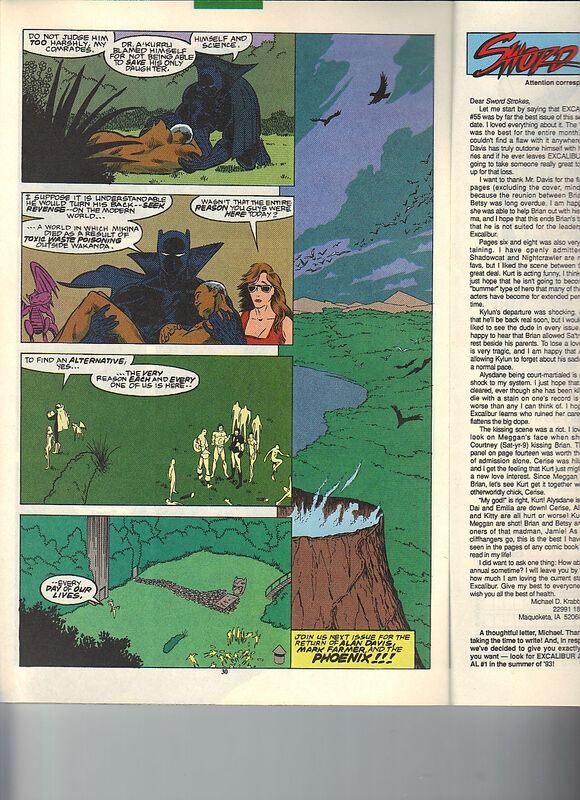 Captain Wakanda saves Meggan, who preferred the Jungle Man name. I do like how, Icon not being familiar with superheroes, just takes it that this team is known as, Excalibur. War Machine points out that Excalibur is a name for a sword, an English sword – so he isn’t sure why they even have that name! Previously, Knight Errant discovered a nuclear warhead and took off. Nightcrawler and Cerise are now talking to Inspector Thomas, about how they didn’t go after the knight, as the warhead was enough of a win. Over at the Eden Park Nursing Home, Mr. Mason (the knight) is going back to pretending to be a feeble old man. Wakanda. 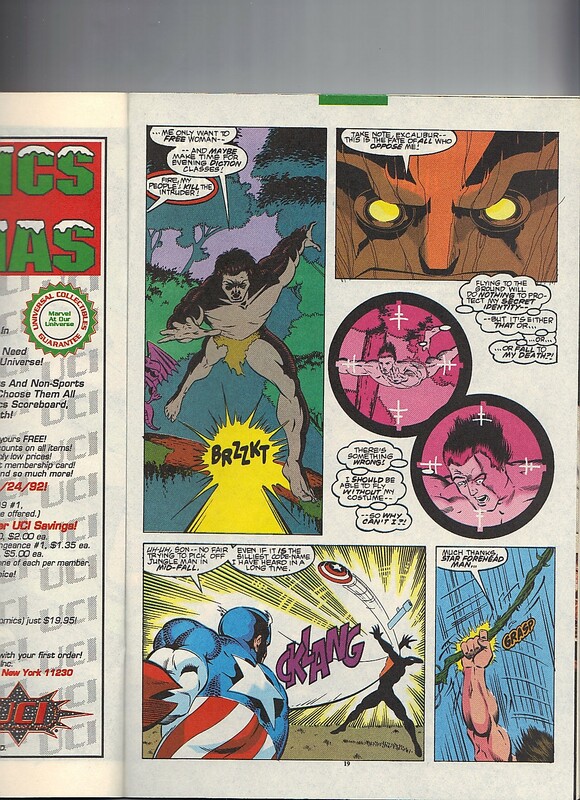 Captain Britain thinks to himself, that he has to really understand his powers more. He is out of his traditional suit, but he should still have his strength and flight powers but he doesn’t. With the power upgrade, War Machine is able to shut down all of the tech-inspired guns, so now Icon is powerless. He falls to his knees and reverts back to human. Black Panther instantly recognizes him as, Dr. A’Kurru, a brilliant scientist. He blames himself for his daughter’s death as she died from radiation exposure. Which is the entire reason why all of these heroes are present, as they were at the conference to settle what to do with all of this excess radioactive waste. Black Panther forgives the grieving father. Kitty points out that Icon’s issue was about to be resolved, on its own so everything is okay. Sword Strokes, has letters from – Michael D. Krabbenholt of Maquoketa, IA / Mike Shamoto of Pearl City, HI / Matt Schrot of Newton, MA / Mr. Joey Marchese of Union, NJ and Dachelle Skipwith of Covina, CA. Back cover ad is for the Super NES Hook game. 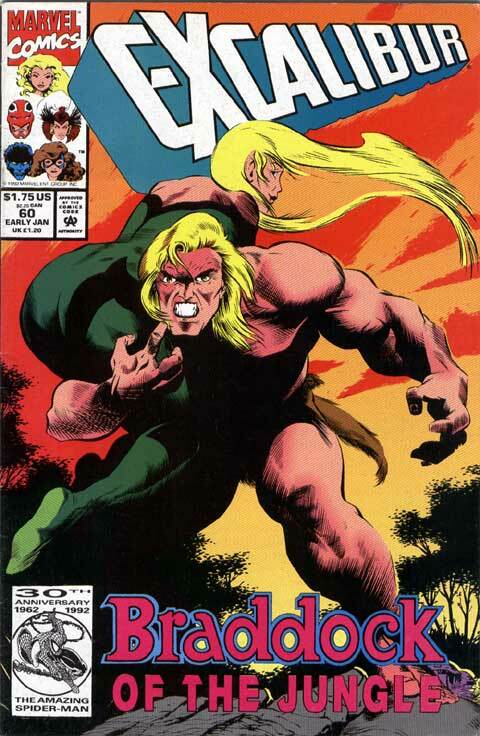 We kick off the Lockheed portion of the month with the last issue of Scott Lobdell’s brief run on the title, before Alan Davis and Mark Farmer take it back, which we will review in our next installment.